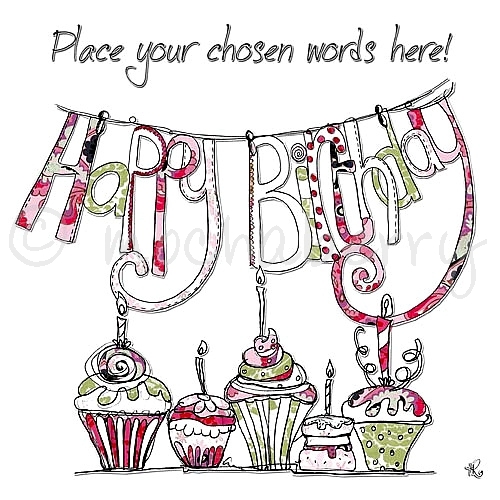 A delightful drawing of lovely bunting made from hanging letters spelling the words "Happy Birthday" coloured in shades of pink and green. Underneath are several gorgeous cupcakes with lighted candles. Hand finished with glitter and various embellishments (not shown). suggestions for use: female birthday, special friend birthday. Each card comes with a quality coloured envelope that compliments the design and is sealed in a clear cellophane bag. The inside of the card has been left blank for your own message.